Some days I feel like I never even leave the kitchen. Today is definitely one of those days. And, I even went to town this afternoon. But, I spent the morning getting dinner ready and the late afternoon getting supper ready. This is really my first year “officially” cooking for the farm. The women around our farm rotate weeks on who cooks the noon meal. During busy times of year (a.ka. planting and harvest) we cook twice a day. For seven days, instead of our normal six. 1. I must not freak out about the grocery bill. 2. 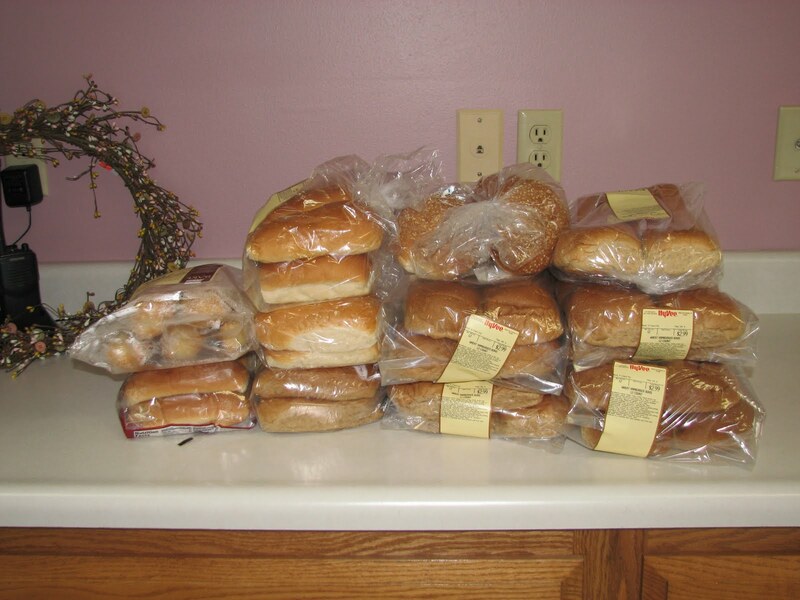 They really should sell sandwich buns in bulk at every grocery store. When you are cooking 6 days a week, twice a day, and you are feeding 4 guys; who normally want two sandwiches a piece, you are looking at roughly 84 to 96 sandwiches in one week. I say roughly because it depends if our hired hand is around or not, or if my father in law gets hungry too. It can be rather fun to come up with 12 different types of sandwich meals that aren’t too messy to be eaten while a tractor is moving. If anyone has any suggestions for simple, easy sandwich recipes please send them my way! Miss Ann from Butterflies and Gourds mentioned that her readers should check in on you, and here I am! Love your stories. I only cook for 1-4 people; it really varies that much! 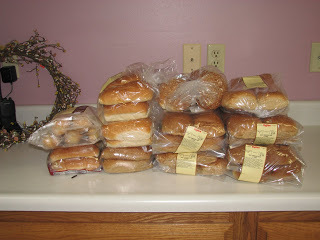 We had brauts today, but my guys are not big on buns; they would rather have a slice or two of bread?!?! I was (and still am) a bun girl, but I roll with the flow. I tried a wrap one day, and my husband ate it. He was surprised how much he liked it! Go figure! In the fall I feed 5 to 7 guys lunch during the duration of the harvest – about 60 days. My mom does the hot supper shift for them. For a change of pace I do a roast beef wrap about once every two weeks. I mix mayo and shredded cheese together with a shot of worcestershire sauce and spread this on large soft taco shells. Then I layer on thinnly sliced roast beef and lettuce. My guys don’t like “exotic” stuff on their sandwiches but you could add other veggies etc. Then fold up the bottom of the shell and roll it from of the side and you have a great sandwich to go. Joe usually eats three but he likes them b/c these will fit in his coat pocket if need be when climbing grain bins or whatever else need immediate attention. Good luck! Lana- Yes, let’s swap some recipes for sandwiches! I normally feed 3 on a daily basis no matter what. But, during busy times it goes anywhere from 3 to 7 or 8. It depends on if it’s the weekend and there are kids around, or if we have any extra help at all. Everyone around here is all about buns! And it has to be the bakery kind from our local grocery store! I haven’t tried any wraps yet because guys do get a little iffy, but after reading Suzanne’s post I might have to try that roast beef wrap! Suzanne- That sounds really yummy and I am printing it as we speak to file away in my harvest sandwich ideas! It’s hard because our guys are such picky eaters too..but they do like tacos on a soft shell, so really it would be the same concept of a roast beef sandwich with a little extra! I love it! Thanks so much for sharing! I was even just talking to my sister in law about how it would be nice to get a lot of farm women together to put together some type of recipe book for field sandwiches. I am thinking of sending an email to all the CommonGround women about getting involved. I am betting you have some other really great recipes you could add!